“Mommy, why do we have an orange sign?”my three-year old inquires as we head out the front gate to walk the pugs. Unbeknownst to my son, he’s just asked his first-ever political question. Nothing slips by him unnoticed these days: he’d spotted the election sign the moment it had appeared on our front lawn, only days into the federal campaign. He’d since pointed out similar signs lining the main roads on our way to preschool – some orange, like ours, some red and some blue. So, how to explain to our little guy that even though we, too, like blue, we categorically don’t want a blue sign on our lawn? That we feel quite strongly about having a bright orange one in its place, at least until May 2? How to even begin to describe the electoral process to a three year-old who has no concept of “government” and “democracy”? As far as he’s concerned, his two moms are his entire world, the ones who cuddle and care for him, shape his days, set limits, and offer him structured choices. He knows he lives in a place called “Canada” but this, in his mind, has stronger associations with his red Olympics hoodie and the “Go Canada Go!” chants from the 2010 Winter Games than with our federal government and the boring parliamentary debate that sometimes overrides The Doodlebops. As for Ottawa, it’s the place we travel every summer in a “big, big airplane” to visit Grandma and Opa. Government aside, how to explain “voting” in age-appropriate terms, other than to say “pick the one that you like best?” And why, in this case, that translates to orange? Indeed, we have thrown our support behind the long-standing NDP incumbent in our East Vancouver riding, the first (and so far, only) openly lesbian MP to serve in the House of Commons. 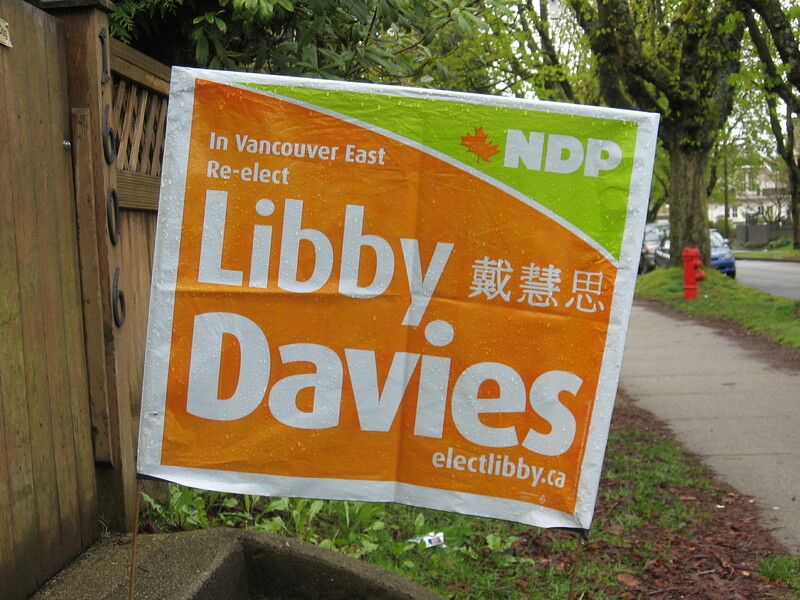 “We’ve put up Libby’s orange sign because she’s the one we want to pick,” I explain. “Like Mommy Sara and Mama Manda?” he asks. It’s a gross oversimplification, of course, but it’ll have to do. I leave out the part about the blue team not being so nice to families like ours, and the nasty, hateful things they said about people like his moms as we fought for our right to marry a few short years before he came into the world. Never mind the fighter jets and the American-style tough justice (along with the building of massive prisons with my hard-earned tax dollars), and the secrecy and corruption and proroguing of Parliament… Or that our family, like many others, got screwed over when the Conservatives axed the National Child Care Program (our monthly UCCB payment from the feds barely covers a day of child care while I teach part-time). My son, oblivious to these complex, adult concerns, runs ahead down the sidewalk in his blue Thomas boots, splashing in puddles. He takes it upon himself to count all the other orange signs on our way to the park, keeping track on his stubby fingers – “Nine, Mommy!” – nary a red or a blue one in sight. Our real discussions about politics are sure to come later, when he’s a bit older. However, this unexpected test run has given me pause. How do you raise a voter without imposing your own political agenda on your kid? (I have flashes of the mock federal election staged in grade five during the Trudeau era – each and every kid voted for the party favoured by their parents. Pierre won by a landslide.) Then again, how can you not? Our political views are inherently shaped by our morals and values, after all, the same morals and values that we impart to our children on a daily basis. As a queer family, simply being “out” in the world is a political act – one my son didn’t choose for himself but that will undoubtedly shape his world view. He’ll either grow up to be open-minded and accepting of differences, perhaps even a champion of social justice issues, or he’ll rebel by becoming the most ultra-conservative, anti-gay person imaginable. In the meantime, my son keeps on counting the orange signs around the neighbourhood. He was the first to notice when ours got stolen, along with several others on our block – and the first to point out when they reappeared, after I’d put in a call to the campaign office. On May 3, he’ll remain blissfully unaware of any changes sweeping our country – he’ll just be sorry to see the signs go – but at least he’ll have had his first, small taste of the electoral process. This entry was posted in parenting, politics, role models, Uncategorized, values and tagged federal election, politics, queer parenting. Bookmark the permalink. The Canadian playwright, David Fennario, has a line in his play Banana Boots, about how he got interested in politics when he asked his dad where the sidewalks came from. Your opening reminded me of that. Topical and engaging as always. And a very good question: Why orange indeed?